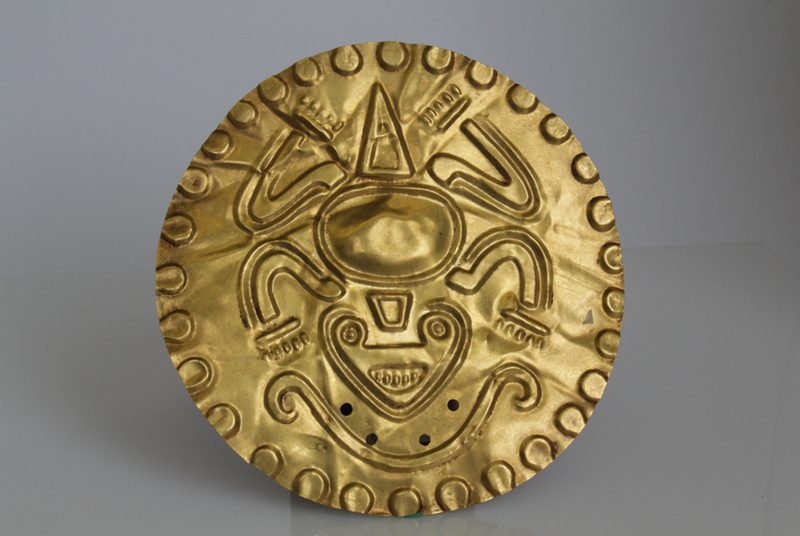 Pre-Columbian gold item in the new "Gold of the World'' exhibition. BADEN-BADEN.- The Faberge Museum opened a new permanent exhibition of more than 100 gold treasures acquired over the past several years at major auction houses and through private purchases. "Gold of the World" includes ancient gold jewelry made in the Middle East, Greece, pre-Columbian South America, as well as a rare example of 18th century British gold, and Faberge gold of the 20th century. Highlights include ancient Greek jewelry made for nomadic Scythians around the 5th century B.C. There is also an exquisite gold drinking vessel from ancient Iran; a gold ring made for the Russian Empress Maria Fedorovna (with imperial eagle and diamonds); and about two-dozen early 20th century gold cigarette cases, most made by Faberge and some by Cartier. Many items were purchased at auction in London over the past several years. A very rare treasure is the Tredegar Gold Cup made in London in 1782 during the reign of George III. This two-handled trophy cup with cover was made by master Gabriel Wirgman. The Faberge Museum purchased it in November 2009 at Christies in London. The Tredegar Cup was originally presented to Sir Charles Gould, a prominent man of his day and the president of an insurance company. There are even oddities such as an early 20th century gold medal with the Cyrillic inscription, "one billion dollars" made for Emmanuel Nobel, a member of the famous Swedish family. He made his fortune in the Baku oil fields of the Russian Empire. "My goal is to show the history of gold jewelry from the time of the ancients until the mid 20th century," said Alexander Ivanov, owner of the Faberge Museum. "Gold has been the most coveted precious metals in the history of mankind, and I want the public to have a chance to see how skilled masters from various cultures across the globe have worked with this metal for centuries to create amazing works of art." About half the items in the "Gold" exhibition are exquisite treasures of the ancient peoples of South America -- the Aztecs, Inca, and Maya. These gold jewelry items pre-date the arrival of Columbus in the Americas, and many once decorated royal courts and temples, as well as the people who served in them. These treasures, however, also recall some of the bloodiest pages of world history. The European thirst for gold in the early 16th century saw numerous expeditions set sail for the New World. The items in the Faberge Museum collection are among the small number still in existence in Europe. These include jewelry in the form of animals and mystical creatures with jingling balls inside, and an Aztec golden sun brought from the New World to the palace of the Spanish viceroy in Brussels. There are also figurines of deities made of gold, as well as pendants made by native South American goldsmiths. Mr Ivanov purchased the pre-Columbian collection in 2001 from the heirs of an ancient jewelry collector in Europe. These items were first displayed in May 2011 at the Faberge Museum, but now they are an integral part of the permanent "Gold" exhibition. Also on display is a late 19th century copy of an ancient Scythian neck adornment. It was made by the Odessa-born French jeweler, Israel Rukhomovsky (1860-1936). In the history of world art this little-known but brilliant jeweler was a bright star that fell into oblivion after his death. The Faberge Museum hopes to spark interest in Rukhomovskys work once again, and in 2009 it acquired three of his works. The neck adornment on display features scenes from ancient Scythian life. On the outer side of the necklace are three sections, the upper of which is adorned with a decorative floral ornament. On the middle section, along its entire length, are various scenes. Two sphinxes are placed on the central part with an inscription in Greek beneath.